August 8, 2016 - By ELLSWORTH AIR FORCE BASE, S.D. Aviators from the 28th Bomb Wing will provide a B-1 flyover down Main Street in Sturgis, S.D., at 3 p.m., Aug. 9 as part of the 16th Annual Veterans Recognition Ceremony. 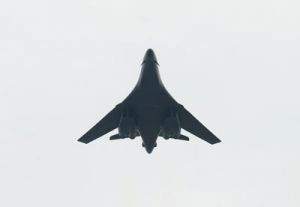 "The B-1 flyover is a powerful testament to our nation's military might and unwavering commitment to preserving the freedoms we all cherish," said Jerry W. Cole, City of Sturgis Rally and Events Department director. "It is the perfect way to honor all those who have served our country and those currently serving." The flyover will cap off an event formally recognizing two South Dakota veterans: retired Air Force Lt. Col. Chuck Childs and retired Coast Guard Boatswains Mate Gordon Lease. Childs career included flying a B-17 Flying Fortress starting in 1941 against the Third Reich that earned him two Distinguished Flying Crosses, continued into the Berlin Airlift, and subsequently the Korean War. Lease was a crewman aboard the U.S.S. LST-381, a landing ship that transported tanks, jeeps with trailers, and 250 men between the fleet and shoreline in support of invasions in Salerno, Italy, and Normandy, France. He earned the Chevalier Légion d'honneur, the highest French order for military and civil merits, for his support of the Normandy invasion where his crew transported 265 soldiers and sailors from the shoreline to England for medical treatment. The B-1 flyover is allowed as part of an approved training mission. Residents living in and around the city of Sturgis could experience an increased noise level related to the flyover. For more information, call the 28th Bomb Wing Public Affairs Office at (605) 385-5056.